Your luck will be guaranteed! Have a piece of the Chinese takeaway at home! 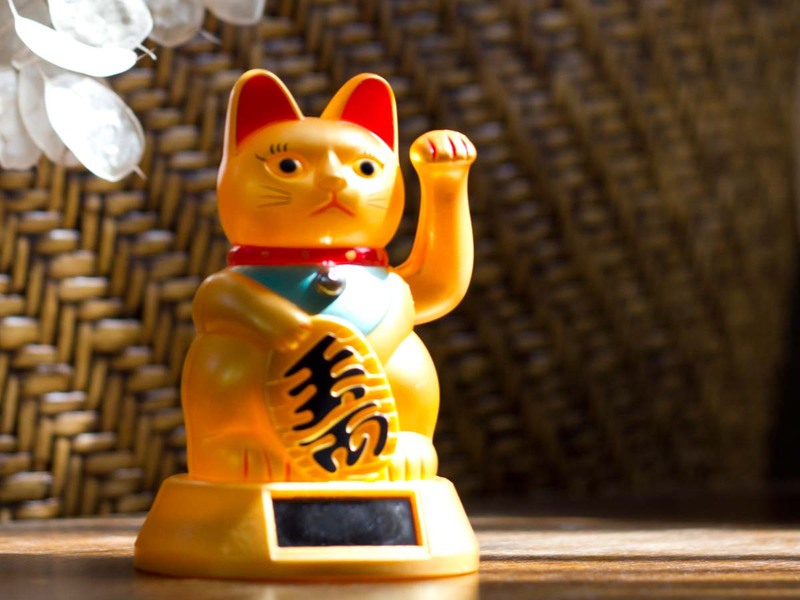 You will have an enchanting talisman in your home with this beautiful "Maneki-Neko" or Fortune Cat. The golden cat will bring its owner a lot of "luck." Who knows, maybe this cat will let you win the next EuroMillions? Or you'll wake up tomorrow with the looks of Brad Pitt or Angelina Jolie? Don't let its huge popularity with Chinese restaurants deceive you. This clawing kitty originally hails from neighbouring Japan. There, the golden cat's raised left paw is a symbol of hospitality. Your visitors will immediately feel at home, thanks to this tireless host. This cat is furthermore a very green kitty, disguised in his golden suit. He is completely powered by solar energy, and you don't even have to put him near the window. He will work perfectly on indoor/office lighting!